"Becoming aware of your energy body is another key tool to unlocking the gateways to conscious understanding and spiritual growth. Learning about the chakras was a major impetus that moved me forward on my own journey of awakening along with recognizing and tuning in to the natural cycles of the Sun and Moon. Of course that journey of discovery never ends and hopefully we each continue to grow and expand in wisdom throughout our lifetimes. In fact, it is my belief that the chakras travel with our souls and spirit from lifetime to lifetime and store the information you have accumulated throughout your various incarnations as well as the cellular memories of past experiences in your present body. In prior columns I have shared meditations for clearing and balancing your chakras along with some insight into what area of the body each chakra rules. This month we will focus on some basic information on what the chakras actually are and how these energy centers influence our physical, mental, emotional and spiritual well being. Chakra is a Sanskrit word that means “Wheel of Light”; the traditional belief is that there are 7 energy centers of the etheric body that lie along the spine and are spinning in constant rotation. There are also chakras in our hands and feet as well as outside the body above and below that connect us to the Earth and the Cosmos but to keep it simple, we will focus on gaining greater understanding of the 7 energy centers that correspond to the glandular system in our physical bodies. They appear energetically as wheel like vortices of light and are sometimes referred to as lotuses since they look like many petalled flowers. The colors of the chakras correspond to the colors of the rainbow. 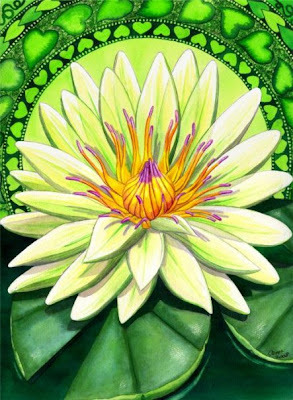 Check out the April 2009 Eye-Opener for the Lotus Bath Meditation that I frequently use for chakra balancing myself. This meditation does not have to be done in a bath, it can easily be adapted to use while sitting in a chair with both feet flat on the floor, laying down or while outdoors sitting cross legged on the ground. The chakras lie along the spine starting with the Root chakra at the base all the way up to the Crown chakra at the top of the head. 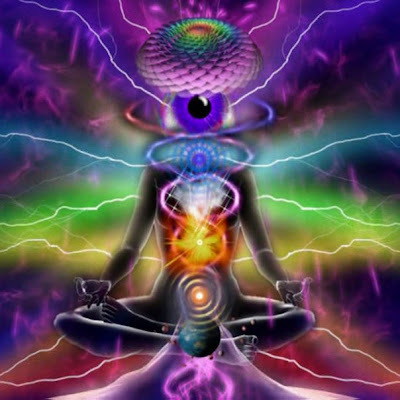 Through the chakras our Spirit and Soul become receptive to and communicate with cosmic energies. Each of our chakras has its own purpose and connection as well as unique energies it is associated with. CG Jung taught that the chakras are the gateways to consciousness. By balancing and raising our awareness of our chakras we can become more receptive to the Divine and unite our Individual Soul with Universal Soul. Experiencing their presence will help you tap into your innate wisdom and knowledge of the chakra system as a spiritual being in a physical body. Carolyn Myss is a renowned author, teacher and medical intuitive who brought the concept and study of chakras to mainstream consciousness. 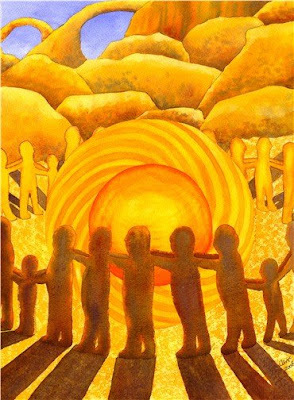 She teaches that the Root chakra connects us all at a tribal level and has to do with basic survival; an energy we all share as a collective experience. With the current economic situation there is a shared level of fear about having the basic needs of life met, with the high unemployment rate and all the changes that Pluto in Capricorn has brought so far it is important to work on keeping the Root chakra open and balanced. If the Root is blocked it will have an effect on every other energy center in the body. An easy way to begin your understanding of the chakras is to obtain a good chart that illustrates and describes the chakras and gives the correspondences related to them such as the body parts and glands, related gemstones, colors, planets, essential oils, recognizing traits of balanced and unbalanced energy centers. Since they are affiliated with the endocrine system and brain they do directly relate to physical health and well being. As you identify and activate them through meditation and study you will find that you can bring balance and harmony to your body, mind and spirit. There is much to be learned from books but in my opinion you can learn what you need from meditation and tuning in to your chakras. 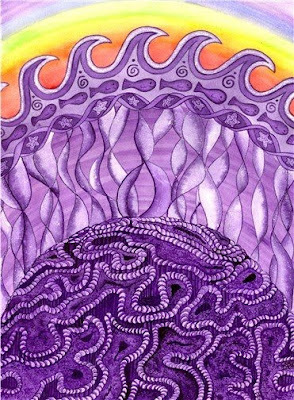 One excellent book on energy exercises and meditation is Your Aura & Your Chakras-An Owner’s Manual by Karla McLaren. Another classic work is The Sevenfold Journey-Reclaiming Mind, Body & Spirit through the Chakras by Anodea Judith & Selene Vega. The information presented here is based on my research and notes from various sources. There are many books on this subject and a vast amount of knowledge to learn, it is actually overwhelming how much there is to potentially study. Learn the basics and let your chakras teach you. The First or Root chakra is considered to be our animal center, it rules basic emotions, animal instinct (like survival) and animal passions (like rage).It is situated at the base of the spine, in the area of the perineum. 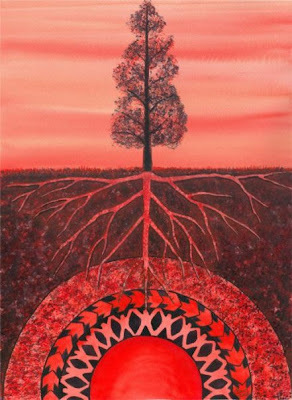 The Root chakra is the primary source of energy and the grounding and manifestation center. Its color energy is red. It connects our physical body to the Earth. In females it spins in a counter-clockwise direction and males in a clockwise direction. It regulates the hips, legs and feet, lower back, sexual organs and blood circulatory system. Feelings of isolation, aimlessness and apathy can be symptoms of an unbalanced root chakra. This can also manifest as being overly attached to material things or being attracted to someone based solely on physical appearance. When the root chakra is well balanced, we experience security, health, ambition and positive life force energy. When in harmony there is a feeling of profound connection to nature. The Third chakra is considered to be the second mind; it is our center of being, where we generate and contain our life force energy. It is located right in between your rib cage, a few inches below the breastbone. Its color energy is yellow. The Solar Plexus regulates the digestive system, stomach, liver, gall bladder, pancreas and small intestine. In females it spins in a counter-clockwise direction and males in a clockwise direction. It relates to personal power, ego, desires, instinct and impulses. The third chakra is the center for astral travel, psychic development and communication with spirit guides. When in harmony there is a feeling of wholeness, inner calm and peace due to balance of the spiritual and material world. Lack of confidence, confusion and pessimism might be indications of an unbalanced third chakra. Being out of harmony manifests as a need to control and dominate others with an emphasis on the material. This is the center of pure love. The Fourth chakra is located behind the breastbone. Its color energy expresses as green or pink. It correlates with universal love and compassion. This is the middle point of our energy system, where spirit, mind and body meet. It rules the heart, lungs, circulatory system, shoulders and upper back. In females it spins in a clockwise direction and males in a counter-clockwise direction. An unbalanced fourth chakra can manifest through obsessive behaviors, lack of self-worth and cruelty. Physical problems include heart disease, blood pressure problems, and insomnia and breathing problems. When this center is in harmony we feel affinity with others, tolerance, compassion and understanding. The Throat Chakra is situated right where the collarbones meet. 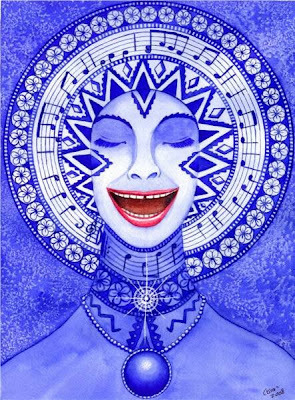 It is the Fifth chakra; its color energy is blue. It corresponds to the thyroid gland which regulates the production of hormones in the body. It also regulates communication of all kinds. This is the point where spirit manifests through creativity, expression, change, transformation and healing. In females it spins in a counter-clockwise direction and males in a clockwise direction. It rules the throat, thyroid, teeth, and ears. It also rules the inner ear and abilities of clairaudience or the ability to hear spiritual information or insight. When well balanced it brings steadiness and inspiration, we know when to trust our intuition. We are able to speak our truth and experience balance in expression. When out of harmony there can be much talking without finding true expression, there is discomfort with silence and fear of being judged and rejected. Physical problems related to an unbalanced throat chakra could be hyperthyroidism, skin irritations, ear infections and back pain. 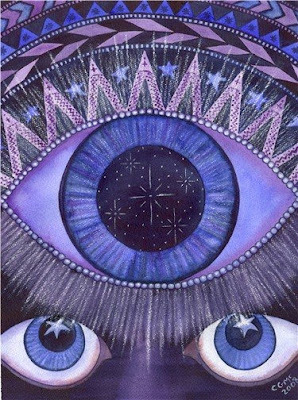 The Sixth chakra is situated on the forehead right between the eyebrows. Its color energy is indigo. It enables the recognition of being and is linked to the pituitary gland. In females it spins in a clockwise direction and in males in a counter-clockwise direction. This chakra rules the eyes and the faculty of seeing, both physically and intuitively. It is our center of clairvoyance or clear seeing. This is the memory and planning center. It rules the eyes, the brain, the face and the endocrine system. When well balanced it brings understanding, good analytical skills. Intuition and inner awareness are incorporated into everyday life. When unbalanced, it causes lack of realism, which might result in delusion. If this center is out of harmony there is a tendency towards rejection of spiritual aspects with an over emphasis on intellect and science. Problems with eyes and sinus can all be symptoms of an unbalanced brow chakra. The crown is the Seventh chakra; it is situated at the very top of the skull. Its color energy is violet or white. It is our connection to the Divine and brings us information on what our higher purpose is. It rules the brain, the left and right hemispheres. This center contains the ability of clear knowing or claircognizance and is linked to the pineal gland. This is the connection point to the Universe, the Higher Self. In females it spins in a counter-clockwise direction and males in a clockwise direction. When well balanced, it brings understanding, wisdom, enlightenment, conscious awareness and blissfulness. When unbalanced, it brings extreme fear (panic), depression, exhaustion, alienation. Knowing about the chakras and working to bring them into balance will help to keep you healthy, happy, productive, expressive and at peace. 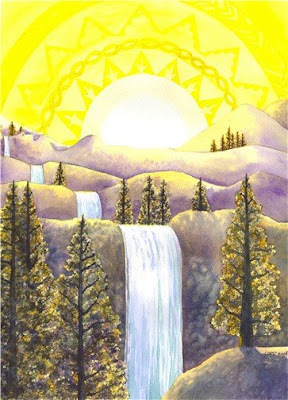 Simply placing your attention on each chakra and breathing deeply into it as you visualize the corresponding color clearing and bringing it into balance is a good way to begin to clear negativity and blockages. Yoga and other forms of energetic exercise such as Tai Chi and Chi Gong also help to bring balance to these energy centers. A good understanding of the chakras and how they work are essential to effective meditation and life mastery. I hope this brief explanation will assist you in your own studies and help to advance your spiritual journey."